The power mode must be in ON to use the seat heaters. There is no heater in the rear center seating position. 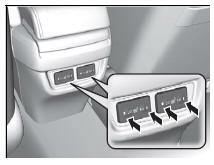 The indicator for your setting comes on while the seat heater is in use. Press the button on the opposite side to turn the heater off. The indicator goes off. While in HI, the heater cycles on and off. When a comfortable temperature is reached, select LO to keep the seat warm. Do not use the seat heaters even in LO when the engine is off. Under such conditions, the battery may be weakened, making the engine difficult to start. In the LO setting, the heater runs continuously and does not automatically turn off.